The temperature is rising and one sure cure is a dip in the cool water of one of Pima County’s nine public swimming pools. The pools open Memorial Day weekend, Saturday, May 28. All pools will be open through Labor Day, Sept. 5, 2016.
in-person at the pool where a resident wishes to take the lessons. Registrations for the first sessions of swimming lessons begin at 7:30 a.m. June 3 at all pools. Novice Summer Swim Team is offered at all Pima County pools except for the Picture Rocks pool. The fee is $20 for the whole summer, including all practices and meets. Registration for the Novice Summer Swim Team begins May 21 at any pool offering the program. 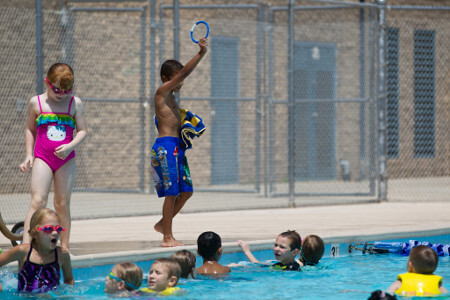 Note: Pools will be open for swim team registration only on May 21, then open for the season May 28. Swim team registration continues during regular pool hours until June 13, or until the team at a specific pool reaches capacity. The first swim practice is May 31. Swim meets are on Saturday mornings or nights during June and July beginning on June 4. Meets will continue through the Championship meet on July 23. The American Red Cross Junior Lifeguard program is designed to prepare tweens and teens between the ages of 11and 15 to become future lifeguards. The program does not certify participants in first aid, CPR or AED (automated external defibrillation), nor certify as a lifeguard, but will introduce the participants to skills needed for entry to the American Red Cross Lifeguarding course. The program runs from June 6 to June 30, at different times, depending on the pool where the student completes training. The fee is $30 for the entire program and includes a Pima County Junior Lifeguard T-shirt for participants who successfully complete the program. Registration can be completed starting at any pool during open hours beginning June 3 at 7:30 a.m. The Thad Terry Pool (NWYMCA) and Kino (Mulcahy YMCA) registration begins Tuesday, May 31, at 1 p.m. and will continue during afternoon open pool hours until classes are full. The schedule for swimming lessons, information on pool admission fees, pool hours, locations and phone numbers, as well as information on the Junior Lifeguard program, can be found at www.pima.gov/NRPR. For additional swim team information, call 520-724-5189 or visit www.pima.gov/NRPR. For more information, please email Grant Bourguet or call him at 520-724-5189.